Democrats lambasted the Senate Judiciary Committee’s plans to convene a hearing on Dr. Christine Blasey Ford’s sexual assault allegations against Supreme Court nominee Brett Kavanaugh Tuesday, while the panel’s top Democrat appeared to doubt the veracity of Ford’s memory. Democratic Sen. Dianne Feinstein of California, the Judiciary Committee’s ranking member, spent much of the day criticizing committee Republicans for moving too hastily. But by Tuesday afternoon, she told reporters that the trauma of the event Ford described may have adversely affected her memory. The senator subsequently clarified that she believes Ford is credible. Republican Judiciary Committee lawyers have begun conducting interviews in advance of Monday’s hearings. In particular, committee lawyers will use a Washington Post story substantiating the allegations as the basis for future interviews. Democrats are not participating in this process, according to a spokesperson. 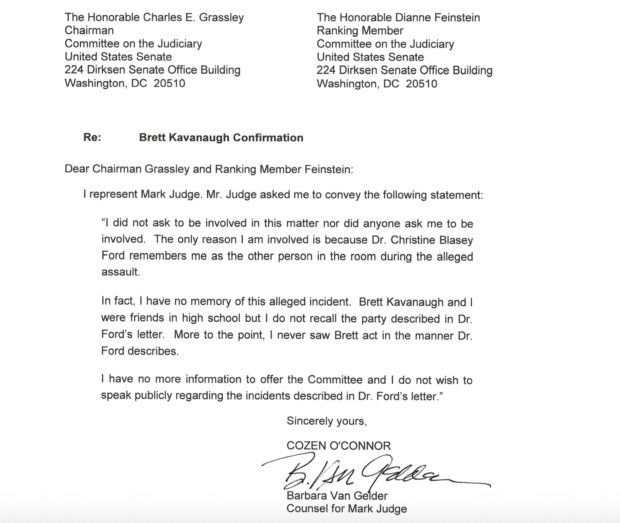 Perhaps the most relevant witness for the committee’s purposes is Mark Judge, a Georgetown Prep student who Ford says was present when Kavanaugh attacked her. Judge’s attorney sent a letter to the panel Tuesday asserting Kavanaugh’s innocence but declining to participate in Monday’s proceedings. As of this writing, it is still an open question whether Monday’s hearing will actually take place. Debra Katz, Ford’s attorney, has yet to confirm that they will appear, or even that they are in receipt of the invitation. Republicans have offered to hold the hearing in a public or private setting, as Ford prefers. It was not immediately clear if the special session would proceed without Ford, though Republican senators gave no evidence to the contrary and Judge Kavanaugh is said to be eager to defend himself. Also unclear was the format the hearing might take. GOP Sen. Susan Collins of Maine suggested Tuesday that Ford’s attorney, Katz, should question Kavanaugh while Kavanaugh’s attorney, Beth Wilkinson, should question Ford, followed by another line of inquiry from senators. A criminal investigation would be unusual, as it is not clear if the Bureau even has jurisdiction over the issue and what the relevant statute of limitations are. However, Democrats argue the FBI could explore the allegation to the extent it bears on the judge’s government background check. This story was updated to include Sen. Feinstein’s clarification on her remarks about Dr. Ford.